The Rangers' Get Well Tour continues. While their injury list grew as Avery and Higgins joined Gaborik in the infirmary, after Wednesday's charitable event in Uniondale where the Isles obtained their first regulation victory, the Rangers traveled to Hockey Country in Minnesota where they gave their hosts and fans their initial regulation victory of the season, losing by 3-2, a slight improvement from the 3-1 debacle at the Mausoleum. 14 games into the season and the Rangers are now in the midst of 1-4-1 stretch after starting off at 7-1. Egads. Now one would think that with the Rangers missing 3 starters that the vets would step up to fill the gap. But other than Prospal, is there any vet capable of raising the level of his game? Dubious proposition as we shall see. Thank goodness for the rookie emergency call-ups from Hartford or the Rangers might have been shut out twice by two of the worst teams in the NHL. 4 points available and ZERO taken. when he was a Ranger? Why did they let him go? The 2nd period, as typical recently, was the turning point. The Rangers trailed 1-0 thanks to a goal by former Ranger & Penguin, Petr Sykora, but Dane Byers (who arrived to the ice about 8 minutes before game time from Hartford), tied the score with his first NHL goal at 1 early in the 2nd period. Look behind thee, Henrik. Belanger converts for a 2-1 lead. 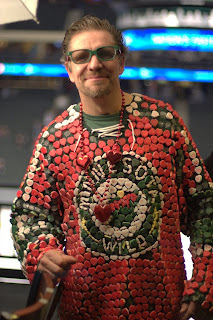 Unfortunately, thanks to a couple of letdowns, the Wild scored 2 goals, the first on a nifty pass by Martin Havlat (a huge disappointment so far) to Eric Belanger who cruised through the goal crease to deflect the puck in with a little more than 6 minutes remaining in the 2nd. 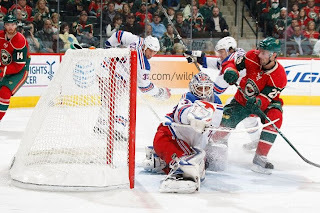 The backbreaker came with 58 seconds left -- another last minute 2nd period goal just like in Montreal last week -- as Staal lost the puck in center ice, the Rangers were slow to react, Dan Girardi was deked out of position by Mikko Koivu. He sent a pass between the circles where Antti Miettinen lined up a shot that beat Henrik between the pads cleanly. With that, Lundqvist slammed his stick down in anger and I glumly said aloud, "Game Over." In the 3rd, with 5 minutes gone, Artem Anisimov and Prospal did some nice work along the right boards in the Minnesota end. Anisimov left the puck for Prospal who was trailing him and dished a pass to Staal who was coming down the left side. Marc shot and beat Backstrom to the right corner to bring the Rangers within one. 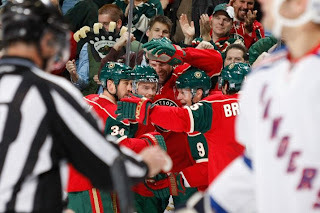 Besides the head's up chemistry between Prospal and Anisimov and the nice aggressive shot by Staal, as soon as Anisimov gave up the puck, he went directly to the net and was in front of Wild goalie Niklas Backstrom as Staal shot, disabling him from having a clear view. Nice thinking by Anisimov. If the Rangers had a valid opportunity to tie the game during the remaining 15 minutes, I missed it as I was distracted by my female houseguests working on their Halloween party vampire outfits. However, a few minutes later Byers again put some serious pressure on Backstrom by walking in on him and taking 3 shots. No Ranger was in the vicinity to lend support and the Rangers quietly went down to another defeat. Lundqvist played a decent game and flashed some nice leather grabbing a rising slapshot from Miettinen. That was a highlight reel type shot. He also toppled to the right and had his stick fly out of his hand after stopping a blistering shot from Brent Burns. The Rangers scrambled to successfully cover while Henrik was stickless. The Wild, 29th in scoring, easily outshot the Rangers. They outplayed them all over the ice. The Rangers had little in sustained pressure, forechecking, rushes, you name it. Didn't Jacques Lamaire move back to the Devils. Capt. Drury, Ryan Callahan, Sean Avery, Chris Higgins -- at their current point pace, they each will get to maybe 30 points. Scream about defensive inadequacies, scream about the goalies' propensity to give up some questionable goals, but look at these guys and realize that they are killing the team. Drury, Higgins & Avery -- apparently they were neutered during the offseason. All those fans who were crying about Dubinsky not being signed -- are you happy that your prayers were answered -- the guy has 9 points but he is invisible and looks like he learned his puck handling skills by watching the wrong tapes of Gomez's ventures as a Ranger? Callahan has lost a step or two since his flu. Meanwhile, Michael Del Zotto has 12 points. I need not say anymore. 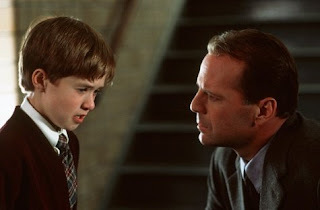 Kid, those ain't ghosts, that's the Ranger's offense. Is the early season success simply a mirage? It's beginning to look that way. Lots of scoring has come from the first line (Gaborik & Prospal), supplemented by the 3rd/4th line and the defense -- the latter being an unexpected benefit. The scoring for the past 2 games -- a defenseman (again) and two youngsters scoring in their first games as Rangers. You've got to be kidding me. I hear the fans crying out in horror on this Halloween morning. Unlike little Cole Sear I am seeing zombies, not ghosts. We knew the team could not maintain a 7-1 pace. That's ok. But they have not maintained the level of play that got them to the early success. The Bruins, Sunday's matinee opponent, are playing Edmonton today in a Saturday matinee. Capt Chiara, he of the 19 goals last season, has not scored yet this season, and Tim Thomas has looked ordinary at times by failing to make pivotal stops (the Devils beat him the other night with a goal in the final moments). The Bruins are not the team they were last season. Either the Rangers right themselves tomorrow or they will continue to administer more get well tonic to struggling teams.